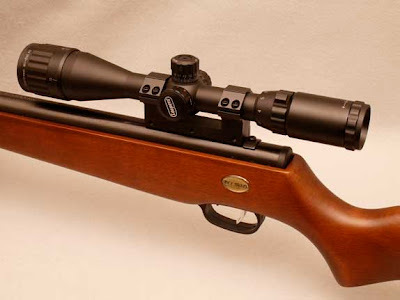 This post contains the first results of a significant test review on the Beeman dual barrel air rifle sold at WalMart and known by a number of names including 1073, RS2 and Grizzly X2. 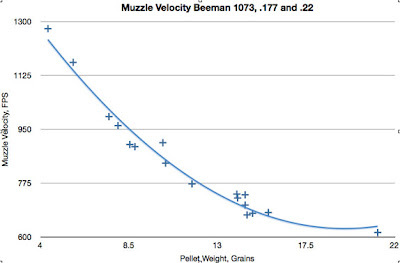 This time we're looking at the muzzle velocity capabilities of this Beeman air rifle. The photo shows the Beeman RS2 with the Archer Airguns Sniper Upgrade Kit. Because the RS2, 1073, Grizzly X2 - or whatever you call it - is available with interchangeable barrels, it provides an excellent opportunity to test the comparative performance of the same gun shooting both .177 and .22 pellets. The barrels were simply swapped to compare the two calibers! 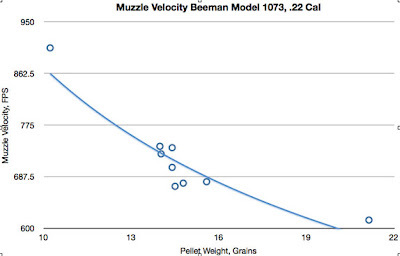 As you can see from the data presented below, there is a very interesting graph showing the relationship between muzzle velocity and pellet weight. The "line of best fit" on the graph shows the basic general trend of the individual point results. As you can see, the highest muzzle velocity was achieved - unsurprisingly - by the lightest pellet, the Crosman Silver Eagle. 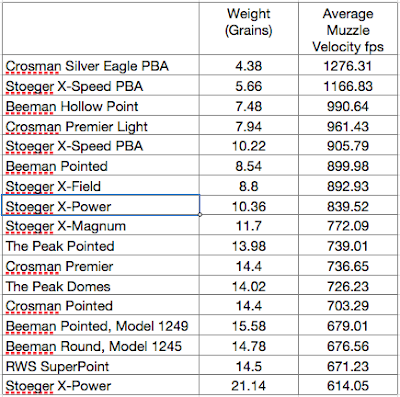 But the .22 caliber Stoeger X-Power pellets weighing nearly 5 times greater than the lead free Crosmans, were still fired at half the muzzle velocity. Yet note that lighter pellets are not always necessarily faster than heavier ones. 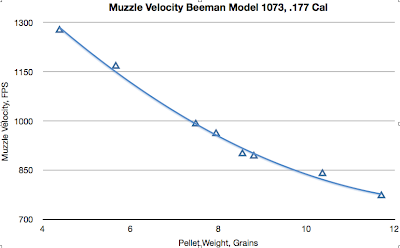 So, we can say that the Beeman Dual Barrel air rifle is capable of muzzle velocities around 1,200fps with lead-free pellets in .177 caliber. 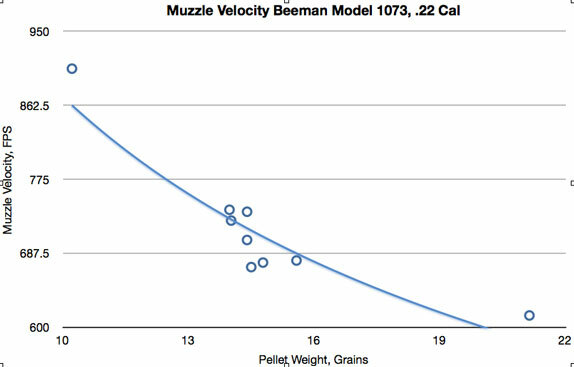 This close-up of the .177 caliber data shows that the Beeman is still producing 772fps with the heaviest .177 caliber pellets tested, the 11.7 grain Stoeger X-Magnum pellets. This means that the claim of 1,000fps for this air rifle in .177 caliber is justified. And here is a focus on the .22 caliber performance. Note that most of the .22 pellets tested had quite similar weights, hence the grouping in the middle of the graph. This information, in itself, shows the difficulty of answering the "how fast does this airgun shoot?" question. It also leads us to consider that muzzle energy - rather than muzzle velocity - may be a better method of assessing the performance of an air rifle. 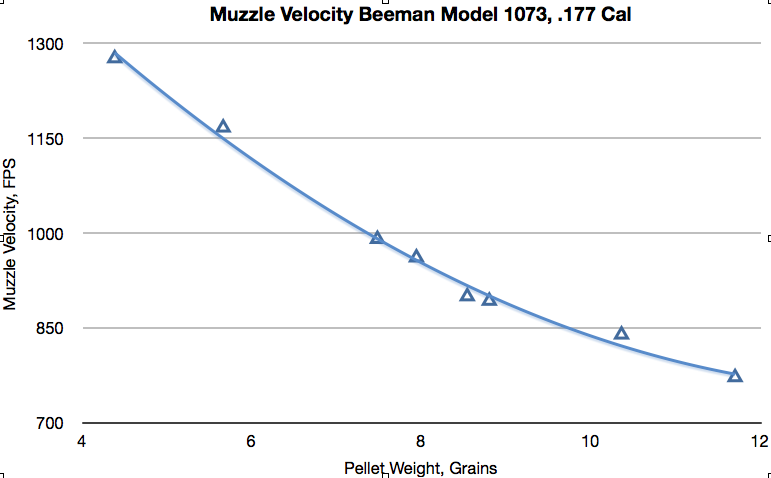 We'll look at the muzzle energy performance of this Beeman air rifle in future.